As I mentioned in my previous post, one of the things that I've been purchasing in my recent Supply Stock-up is frit. Today I got a shipment from Dragonfly Glassworx. Thank you, Julia! I LOVE it! Frit is perfectly good glass that has been smashed and sorted according to size. Powder is, well, powder. Size 00 is tiny but visually recognizable as chunks. Size 5 can often be the size of a bead, so is often attached to a spare hot rod of glass, melted, then pulled into long, thin fiber-optic-escent strings called, um, stringers. Stringers can actually be anything up to about 2mm in diameter and are used for surface decoration on beads. In between 00 and 5 are, as you may have predicted, 0, 1, 2, 3, and 4; 0 and 1 being the most likely suspects for bead use. One of the pioneers of frit use in beadmaking is Val Cox, who, looking for a vibrant pink, found the awesome range of COE 96 colors that were used by glass blowers. She began making frit and frit blends available to other beadmakers. Over time other "fritologists" began to make frit and frit blends available. Some vendors began to produce COE 104 frit, since the majority of beadmakers work with that type of glass, but the advantage of COE 96 furnace glass remains: the concentration of color within the COE 96 matrix is much higher than in COE 104 glass, so using small shards of frit won't result in muted colors on the bead. COE 96 frit just looks more vibrant than COE 104 frit. So, from this point forward, when I say frit (unless I'm specifically talking about borosilicate glass, which also uses frit) I mean small glass fragments with a COE of 96. Let me briefly revisit a point I made in my last post: bad things happen when mix glasses of different COEs ... usually ... sometimes. Remember that the COE stands for Coefficient Of Expansion, where expansion is 10-7inches/°F. In reality, when you're talking about COE 104 glass and a lead-rich (read: pliable) COE 96 glass and the COE 96 glass is only a little bit of frit on top of an otherwise substantial COE 104 bead ... well, often nothing bad happens (though I do find that I increase my chances of making it work by putting it directly into a garage-temp kiln to await annealing). The point being that many COE 104 beadmakers use frit that is (often exclusively) COE 96 and by using a small amount of frit they get away with it. Wanting to reduce my own risk for cracking, which tended to happen too frequently for my taste, I purchased COE 96 rod to use with my frit. Mixing COE 104 and COE 32-33 is still a WAY bad idea. As of this writing I've purchased frit from five different frit blenders: from Robin at Glass Diversions, from Sabrina at Val Cox Frit, from Christine at FenG Frit Factory (who also makes and sells her FANTASTIC murrini), from Leslie at That Frit Girl, and from Julia at Dragonfly Glassworx. There are other vendors, too, but my budget is not, unfortunately, unlimited. All of the small frit providers carry at least two container sizes of frit, usually a sample size then a production size. The sizes of the containers and the prices vary from vendor to vendor. For example, what I like best about Glass Diversions is that Robin will let you choose a "sampler" of six colors in 1.5oz containers for $28; I find that's a really great value for fairly large sample sizes of frit blends. Val Cox also has "Ample Samples," with pretty labels in heavy 2x3" resealable plastic bags for around $3.00, Dragonfly Glassworx has a similarly-packaged similar size sample for a little less than $2, and FenG Frit Factory has her samples available for $1.50USD (USD because she's in The Netherlands). Dragonfly and FenG also have borosilicate blends, which I think is fantastic since some days nothing seems quite as satisfying as seeing the delicate rainbow of colors only boro can produce. The friendly folks at Olympic Color and Hot Glass Color also sell the individual frit (and cane and rod) colors that come from the furnace glass manufacturers, which is nice if there's a color you really like or use a lot of like, maybe, white, black, clear, or Reichenbach Multicolor ... but the minimum order is a half kilo (about 1.1 pounds) - at least at Olympic Color, where I purchased my last bunch of frit. N.B. : If you decide you want to buy some "rods" from them (since that's what lampworkers generally call their glass), understand that glassblowers' rods are something like 1.5" in diameter. To use furnace glass in the same manner that you use glass rods in COE 104 glass what you'll want to purchase is labeled 'cane'. That Frit Girl carries reasonable priced 1 and 2oz packages of pure frit color for those beadmakers not wanting to buy that much. Additionally, if you want to make some beads for the program Beads of Courage, Leslie will send you a free sample of any colors of frit you want to try, so long as you send her the beads back to be sent on to the program. Briefly, Beads of Courage provides beads to hospitals for children undergoing treatment for serious illness. After each treatment, the children are given a bead in a color representing the specific treatment, to string on a necklace. This helps give ill children something to look forward to as well as help them visually document their progress. All COE 96 unless otherwise specified. Top Row, from left: I don't actually remember what the first one is made with - probably Reichenbach Multicolor rod on a clear base, Gaffer Blue Chalcedony rod probably also on a clear base with some other color mixed in, Reichenbach Multicolor frit on Rootbeer transparent base. Second Row, from left: Reichenbach Multicolor frit on base of clear and a layer of Zimmerman Purple Rose Special frit, (another) Reichenbach Multicolor frit on Rootbeer transparent base, Zimmerman Purple Rose Special frit on a base of clear with Val Cox Fairy Dust frit, Val Cox Fairy Dust frit on an encased base of Gaffer veiled gold lustre/white cane, (COE 104)Double Helix Olympia Rain on a base of black. Third Row, from left: Val Cox Ferrari Red frit on base of clear, Val Cox Mood Swings frit on base of clear, Val Cox Enchanted frit on base of clear, Val Cox Fairy Dust frit on base of clear and Val Cox Violet Storm transparent frit, (yet another) Reichenbach Multicolor frit on Rootbeer transparent base. Bottom Row: all Zimmerman Purple Rose Special frit on a base of clear and Reichenbach Enamel White frit. Like Christmas ... But More Glass! Today was a red banner day when it comes to getting shipments of exciting new things. The stars have aligned in my supply-buying world. Money from classes, I made another sale, tax refund, and supply SALES! So, I've been ordering glass, tools, and frit blends (frit is little glass shards used to create organic patters). [COE 32-33] Glass Alchemy borosilicate order, now with SHARDS! Oooooh. [COE 96] Glass Alchemy order: Zimmerman (no-longer-in-production) z-77 Avocado cane, z-850 Lilac cane, and z-851 Lilac Rose Special cane, z-99 Purple Rose Special rod . Look at those rings of color. DELICIOUS! The end of the z-99 Purple Rose Special rod. The side of the z-99 Purple Rose Special rod. Glass isn't monotone. It's reactive, it's multidimensional, it's amazing. Plus, you get to melt it with a torch. Come on! I don't know why you aren't all signing up for my lampworking classes right now. Torches! Alright, maybe I'm the only one with a borderline torch disorder, but I'm comfortable with who I am. But the glass ... well, if you don't see the fascination, I just don't think the issue is on my end. So, glass. Why do you have to spend good money on it when it's in Prego jars, lightbulbs, or window panes? It's because of something called Coefficient of Expansion, or COE . When glass is heated it expands (for the techies: [COE]x10-7 inches/degree F). There's a little more to it than this, but more or less, if you melt together two different glasses that expand at different rates everything's good when the glasses are molten, but when they cool ... that's a different story. Of course, exploding glass might be your thing, but it's hard to sell. Because of that, companies spend a lot of time in research testing their glass to make sure every color is compatible with every other color it manufactures. New companies usually choose one of the COEs on the market and make their glass compatible with that. When glasses are tested compatible you can use them together. No one has tested the Prego jar yet. The main COEs on the U.S. market are 104 soft, soda-lime glass; 96 Furnace Glass; 90 soft glass produced by Bullseye; and 32-33 Borosilicate glass, which is the same as the commercial brand Pyrex. I use them all and each has their charm. 104 is easy to melt and use, has a huge range of colors and brands that are easy to obtain. 96 has uber intense colors, and some of those colors just aren't available in 104, like a wide range of intense pinks. 90 was, I believe, originally formulated by the Bullseye company for glass fusing; whether the rods were originally made for lampworkers or not, we certainly use them now. The advantage of Bullseye's line is the colors are amazingly stable with very little changing or bleeding after heating or applying on or next to other colors. Borosilicate glass ... well, Boro merits a post for itself. It's a metal-rich glass that is highly reactive. Many 'colors' of rod can actually be coerced to produce the entire rainbow of color in a single bead (or sculpture). It's hard to melt, but it's less sensitive to temperature fluctuations, so it's more forgiving in sculptural use than other glass. Beadmakers just love the colors. Since I have classes this weekend that I still need to prep for, I can't go out and make beads with all of my new, beautiful glass yet ... at least not more than the couple of test beads I was compelled to make. But when I do, wait until you see the pictures! I know you're not as excited as I am, but I hope you're more excited than you were before! Know how it seems easier to get things done when you have a lot on your plate? You just can't afford to be lazy, so you power through everything and feel great. I feel like I'm on an awkward cusp of that feeling. Before Sawyer was born I don't think I truly realized - there's quite a lot of time in the day. The realization came after spending most of that time with an 11-month-old extrovert within three feet of me at all times. As an introvert, someone that requires alone time to recharge, sometimes (and the mommy police won't want to hear this) the day just D R A G S on. While I tend to my now-walking-exploring-touching-eating-EVERYTHING adorable little boy, my torches sit alone and unused in my studio. As an introvert with ADD, jewelry design became an important outlet for both of those traits. It is my solitude. It reinvigorates me. Silly as it might seem to anyone else, it's a joy to wake up and pull cool beads out of the kiln that were just shades of orange when you made them, the last time you saw them. It is also where I go to refocus. If I don't feel like I've been productive in SOMETHING after I've struggled focusing on something else - homework, finances, cleaning - guilt sets in, the cascade effect ensues, and terror follows. Terror? I still have dreams that I have a final tomorrow for a class that I never cancelled and never attended. Sean is always my savior. After he works a long day trying to write exceptional program code between frantic questions from other software developers he comes home and begins his second job as Dad. It's at that time that I step away from my full-time position as Mom and go to my second job called jewelry designer. Some days I work at the torch, others I work on my website or other marketing duties. I comparison-shop and purchase raw materials, locate out-of-production materials, create class samples and handouts, and sometimes jewelry I can sell. It's the time I need to remember my other facets. The time where I get to use my talents on something other than singing fifty-eight verses of "The Ants Go Marching" or playing "Peek," "Catch-Me-Crawling-Up-The-Stairs," or "Hold Me." I would never say those are unimportant things, but I stop being able to do them well without balance. Thank you Sean! Of course, when Sean comes home, I've had just as long a day working as he did. As important as it is to use my outlet, sometimes I'm just tired. Sometimes I lack motivation. That's why I can't thank you all enough for taking the time to help me link this blog to Facebook. Thank you for indicating you had even the teensiest interest in reading about the jewelry designer part of my life. You are my motivation. You ROCK my world! Next weekend at Sticks & Stones in Mankato I'm teaching a class called Iron-soldered Stone Pendant, which teaches one way to hang a stone without holes and emphasizes how to texture leaded solder, and a basic torch soldering class where we'll be making a simple small-link chain. The weekend after that, same bat-location, it's a lampworking weekend! I'm ultra excited about that. It's a lampworking refresher in the AM, focusing on making nice shapes, and the many important reasons for learning to layer glass neatly (like even color distribution and pretty hole puckers). In the afternoon we're doing Lampworking III, which will focus on making pendant-sized beads (with the kiln on, waiting for your beads); it will also address silver reactions, using a rake, using murrini, and using bead presses. As I was checking Facebook this evening, the lovely GafferGirls were working on linking their blog to their Facebook profile so we, their loyal Facebook friends, could follow their blog though Facebook. How efficient! Of course I thought ... hum! I wanna do that, too! So, I did and now you can see the option to follow my blog in the right margin. I'm using the excuse that it's new to explain why I'm the only follower ... but you can sign up right now and change all of that and you can keep abrest of all the cool jewelry-and-glass-related fun facts that I'm working on at any given time. 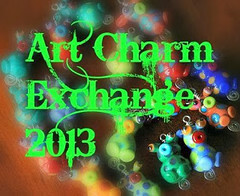 In other news, I recently joined the forum Lampwork etc. (LE), which is amazing. In less than a month I've acquired enough of the out-of-production Zimmerman z-99 Purple Rose Special to experiment for a while, as well as had the opportunity to try Zoozii's large tab press and chunky crystal duo press. Plus, the people are GREAT! Even though I'm still lurking a bit, it's nice just to know there are so many like-minded, fabulous people out there! If you decide you want to give it a try, tell them that AutEvDesigns - my LE username - sent you! OH! Speaking of news ... 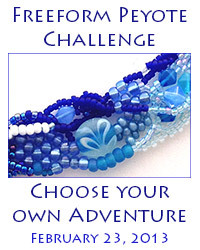 The Ocean Waves Beaded Bracelet that you see in the ETSY box on the right? 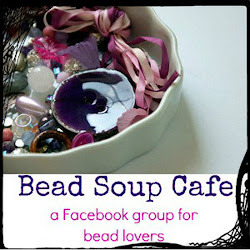 It's going to be published in the WORD section of the June/July 2010 issue of Beadwork! Hooray!